When ProShares first released their Ultra ETFs, I got a quirky idea. Buy the long and short S&P 500 ETFs (SSO & SDS) in equal amounts to make a market neutral position. Ultimately I lost a little money and directed my attention elsewhere. Almost 3 years later I’ve come back full circle, but rather than buy these ETFs, I’m selling them. With the S&P 500 down 30% since July 2006, the best trade has been to sell short. SDS is up 30%, not bad, but SSO is down 70%! Why buy SDS when shorting SSO has more juice? Moreover, you can hedge by selling SDS, rather than buying to cover. Since inception, this strategy is +40% (SSO -70% and SDS +30%). Designed for daytrading, these vehicles should not be bought by investors, but can be sold short by bold risk takers who understand margin and compounding percentage moves. 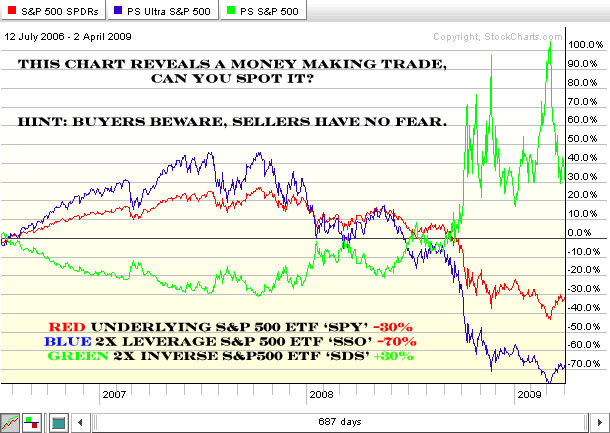 Swaps are worthless contracts, and the convexity of these issues favors the sellers, not the buyers. Nevertheless, there are risks, and as such, this is not a fool proof trade. It can blow up big if the market trends in one direction for many days in a row.